There are many events going on around the city in honor of the second annual Fashion’s Night Out; however, Beverly Hills is giving fashion lovers a reason to spend their cash within their city limits. 90210 will host the most elaborate event of the evening on Rodeo Drive. The shopping extravaganza will feature a variety of events that include celebrity appearances, DJs, art installations, new product launches, complimentary manicures, gifts with purchase, tastings, and much more. 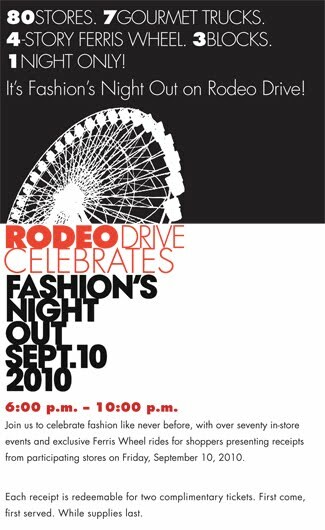 The highlight of the evening will be a four-story Ferris Wheel located on the 200 block of Rodeo Drive. Complimentary rides for two will be available to guests who show receipts of purchase from participating stores. Other events for the evening include a free manicure at Chanel to celebrate the launch of a new collection of polishes, Les Khakis de Chanel. Lacoste will host a Wii tennis tournament and at Giorgio Armani Samuel L. Jackson will host an exhibition of his favorite red carpet looks over the years, which will be displayed on mannequins and accompanied by a question-and-answer session with fashion critic Steven Cojocaru from 6:30 to 8:30. Valentino is having a casino night. DJs Super Mash Bros. will be spinning at Emporio Armani and DJ Rick Khan will be at Roberto Cavalli where the Cavalli cocktails will be flowing. Geary’s will host a “gentleman’s lounge” with Scotch, beer, hors d’oeuvres, and an impressive display of Rolex and Patek Phillipe timepieces. Tod’s will be selling a limited-edition handbag for the event. Salvatore Ferragamo is celebrating its first collection from new Creative Director Massimiliano Giornetti with the launch of his W-bag purse. Tiffany will unveil the new Tiffany Yellow Diamond collection, and Coach will have LA-based artist Louise Chen on hand to customize its limited-edition FNO tote. You’ll probably work up an appetite after all that shopping so be sure to hit up one of the 7 gourmet food trucks that will be parked along the streets of B.H. Border Grill Truck, Cart for a Cause, Coolhaus Ice Cream Sandwiches, Frysmith Truck, The Gastro Bus, The Grilled Cheese Truck, and SprinklesMobile will all be on hand to service up some delicious delicacies.